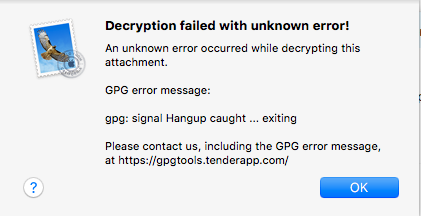 GPGMail: Decryption failed with unknown error! Decryption failed with unknown error! An unknown error occurred while decrypting this attachment. could you please download and install our latest GPG Suite nightly build and see if the problem persists. That page also has sig and SHA256 to verify the download. Should the error persist using the nightly build, please send a debug log from your affected machine: Open System Preferences > GPG Suite > Send Report. Check the box to "attach debug log". Since you already described your issue in this discussion, you don't need to add a lot of detail, but please do add the link to your existing discussion, so I can then merge your debug info with this existing discussion. this issue has been fixed. If you want to test the fix, please download our latest hotfix GPG Suite. That page also has sig and SHA1 to verify the download. Should the problem persist, please do let us know and re-open this discussion. Disclaimer: This is a development version which has not been thoroughly tested yet, so bugs or crashes are to be expected. Thanks for helping us test this fix. Steve closed this discussion on 17 Mar, 2018 01:11 AM. Steve closed this discussion on 17 Mar, 2018 01:44 AM.